Sorry so long in reply to yours, we recd. the package OK but haven't opened it yet - Eda joins in loving thanks & appreciate your sweet thought but still wish you haven't gone to all the trouble. I haven't been feeling too good this last week or so, so Eda had to do the shopping herself - she got a doll & lipstick for you & is on its way now. I didn't see the Doll but understand its an early American style - hope you will like it & is what you wanted. Encl. are the photos you requested for the girls in "Binns". All here is as usual so not much to tell you - Happy Xmas - lots of good health & happiness in '56. We were preparing to make some new pictures at our old studio when this thing happened, so the deal had to be postponed till I am in shape again. The doctor figures I will be okay by April and will be fully able to continue. Thanks so much for your very welcome letter of the 19th.inst. It was Indeed nice to hear from you after so long, enjoyed all the news about yourselves. It must be going on two years since we saw you last - does'nt time fly.! Sorry to hear the puppy died, he probably could'nt stand the lousey Butterworth circuit, or maybe he was mad they did'nt make him a WATER RAT.! Interesting to hear the Newman's had opened a confectioners shop, I imagine that should be a very good business - hope they do well. Was pleased to note Jimmy Elliot has a nice steady job, he's certainly better off, am sure he will be much happier. Both Babe & I have been on the sick list for several months. On account of heart trouble Babe had to go on a strict diet to reduce weight - lost about eight stone. Then to make matters worse, I had a slight stroke (left arm & leg paralyzed) & was in hospital several weeks for treatment. However pleased to tell you I made a wonderful recovery & am nearly beck to normal again thank God. I was very lucky indeed. We were preparing to make some new pictures at our old studio (Hal Roach) when this thing happened, so the deal had to be postponed till I am in shape again - the Dr. figures I will be OK by April & will be fully able to continue. I had a letter a while ago from Cingalee, Claude had been in hospital for several months at Blackpool - did'nt say what the trouble was, but understand he's out and around again. Also Roy Lester married Pauline & she has had a baby - guess you heard about that. Sorry you had to have an operation, must have been very painful, hope its much better by now. Is'nt It awful, all the things we have to go through?. Do you ever hear of Dorothy McKenzie Reid? I get the "Performer" every week, but never see her name in the calls - wonder if she left the bus, too. No, I doubt we shall ever come over again. I was very fed up on the last trip & was happy to get away, the Variety bus. has certainly deteriorated. You sure have had a lot of enjoyment out of the caravan, it was a wonderful investment - must have paid for itself over & over again. The weather here in Southern California has been lovely, but we are expecting some heavy rain soon, due to the weather conditions up North. Am enclosing you a piece of this mornings paper, its really a bad situation - understand about 500 homes floated away & many Towns have been evacuated entirely - thats a hell of a Xmas present poor devils. Well, all for now. Eda joins In every good wish for a very Merry Xmas & Happy Prosperous '56. lots of good health & happiness - will drink to you both to-night. Lawrie's painting hangs in our hallway, so we often think lovingly of you. Bye. 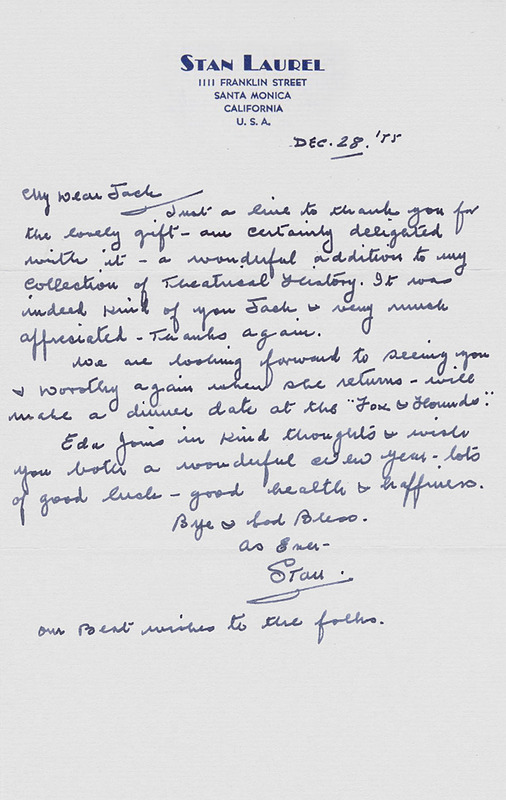 Just a line to thank you for the lovely gift - am certainly delighted with it - a wonderful addition to my collection of Theatrical History. It was indeed kind of you Jack & very much appreciated. Thanks again. We are looking forward to seeing you & [Dorathi] again when she returns - will make a dinner date at the "Fox & Hounds." Eda joins in kind thoughts & wishes you both a wonderful New Year - lots of good luck - good health & happiness. I am really very much ashamed of myself for not having written you sooner but, as I imagine Stan explained to you, at the time we received your letter, Babe was recuperating from a session in the hospital with virus pneumonia and, in addition to his rather long recuperation, the doctor said he must lose weight and so put him on a very strenuous reducing diet. As a result of that he lost 7 stones. Apparently that weakened him somewhat and lowered his resistence as he is now recovering from another attack of pneumonia — I can't help but feel that the drastic loss of weight has been the partial cause although the doctor says not. Anyhow, he is now on the road to recovery but still quite weak. Aside from Babe being sick — It seems one or the other of us or someone in the family has been sick all year long. My Mother was in hospital in August and my younger Brother was also in hospital in September. In the meantime Stan was ill and in hospital for a while - as he probably told you - and now I have been suffering from a sprained back for the past 2-1/2 months. And the strange part is, I don't know how or when it happened. I've been having to wear a back brace to support the muscles until they have had a chance to heal but hope to be out of it soon as I am now starting to feel ever so much better. We were truly very, very sorry to hear about Claude having been so ill but are glad to know that he is now much improved (according to Stan), and do so hope that his improvement now continues by leaps and bounds so that he'll soon - in 1956 - be his old self again. I know that you, as are we, are looking forward to 1956 as a much happier and healthier year. This 1955 certainly hasn't been our year and it certainly hasn't been too kind to you poor Dears either, has it? Except for Pauline — Thank goodness it's been kind to someone — and we are so very happy for her. Know you must be thrilled to death over the baby. Please give them our love and very best wishes. Do take care of yourselves and know that we wish for you a Happy, Healthy & Prosperous New Year — All the best of everything - And everything you may wish for. Merry Christmas, Happy New Year - And God Bless you both.